Please understand that my rating isn’t the same as the Goodreads system and that when I give 3-stars, it means that the book was okay for me. If I were to rate this book based on the Goodreads rating system, this book would probably be 2 stars. One thing that really, really annoys me is that there is absolutely no mention of anything that happens in Red Rising! For readers out there, I’d highly recommend skimming through Red Rising before reading this one, otherwise you’ll be like me and have to reach 57% of this book to figure out what the heck is going on. 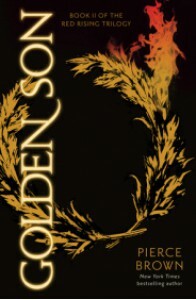 Golden Son is distinctly different from Red Rising. Whereas Darrow was a somewhat believable character in Red Rising, in Golden Son he is just plain glorified because he’s the main protagonist. Plus the events that lead to the cliffhanger ending was just plain irritating. Augustus died too quickly. And nothing is shed on Darrow’s intentions. Almost all the people that turn onto Darrow was so unrealistic! Look at Cassius! And Roque was my favorite! I loved him so much! What happened?! And honestly, this is what annoyed me most of all: why the eff are so many people dying for Darrow?! I don’t get it. I seriously don’t. Call me a traitor, but I wouldn’t die for Darrow! Because in the end, Darrow would still win! This book was okay, I was annoyed about Darrow and the world-building, but maybe this book was lucky in the sense that I was in the mood for a lot of political tension (even if all that went down the drain). The cliffhanger does have me curious enough to read Morning Star, so we’ll see how that goes.